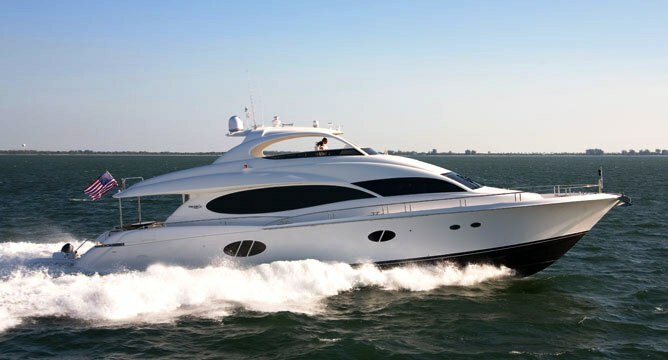 Motor yacht CASTAWAY is a Lazzara 84 built in 2006 measuring 25,91m (85’). 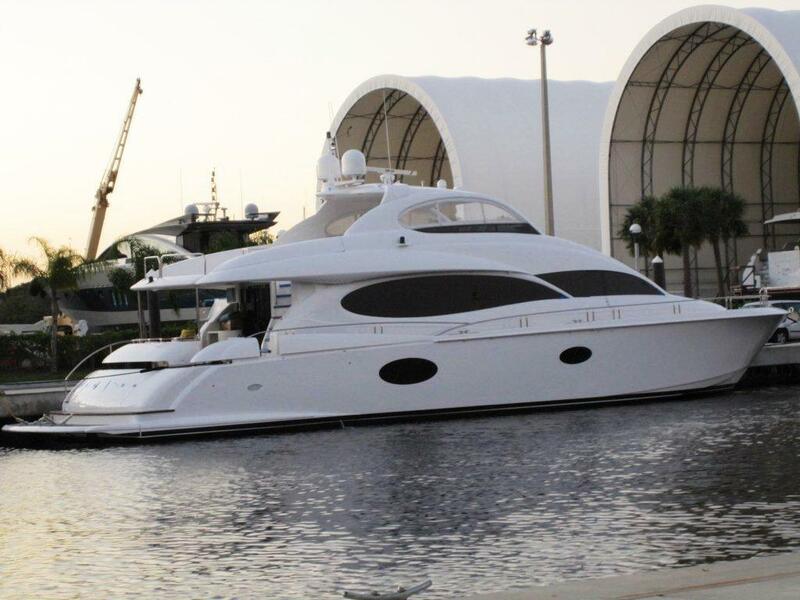 She is able to accommodate up to 8 guests and is available in Florida and the Bahamas in the winter and the East coast of the US in the summer months. 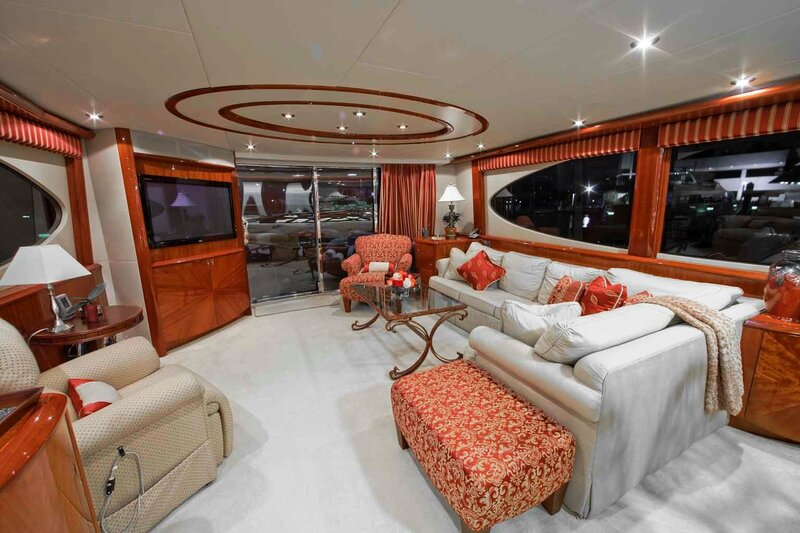 M/Y CASTAWAY’s main salon is beautifully styled and features white carpet and couches complimented by high gloss wood and coral coloured chairs, cushions and blinds. The salon is inviting and comfortable while providing plenty of natural light and space. The adjoining dining area has an extendable table with space for 8 guests. The main salon, aft deck and all guest staterooms have independent Direct TV service for the TV, DVD players, stereo and I Pod hook ups. The main salon also features an X box, full DVD and CD library and assorted board games. 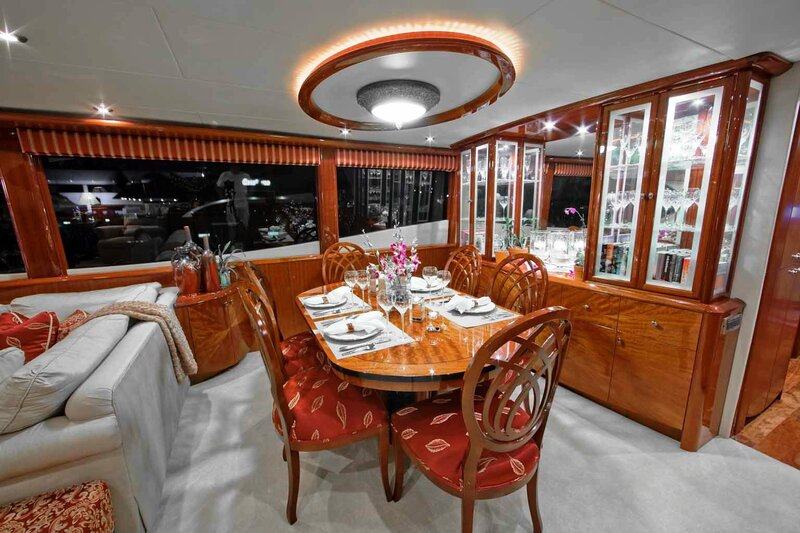 Charter yacht CASTAWAY underwent several upgrades in 2009 and 2010, including the addition of exterior cushions and interior soft goods along with mechanical and systems upgrades. CASTAWAY yacht is able to accommodate up to 8 guests in 4 cabins. 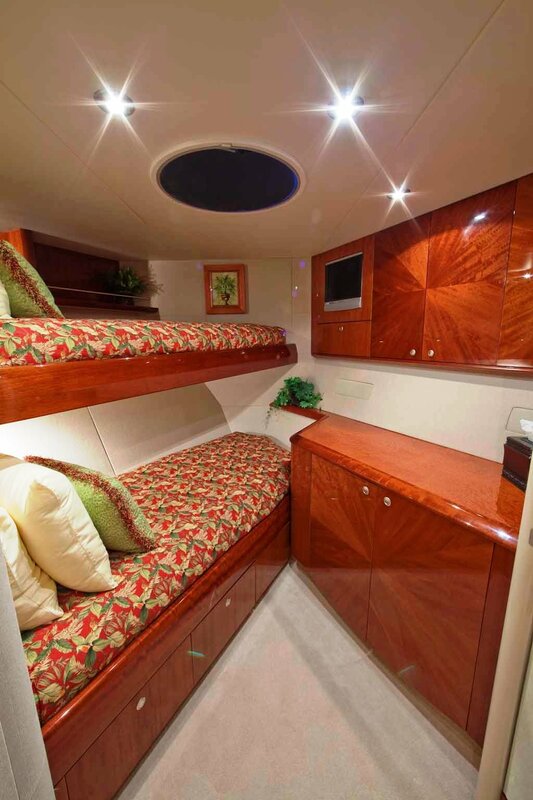 Her Master cabin features a king size bed, a couch and sitting area to port and an office desk or vanity to starboard. 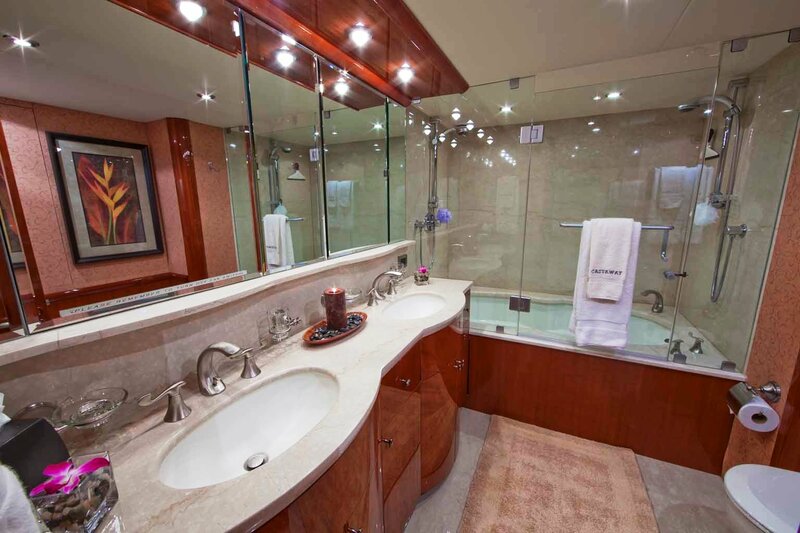 The master ensuite is very large for a yacht this size and features a full Spa Pool tub and shower. There are two mirror imaged guest staterooms that feature a queen size bed with a large closet and plenty of space. Each room has its own en suite bathroom with large shower and vanity area as well as a full entertainment set up. 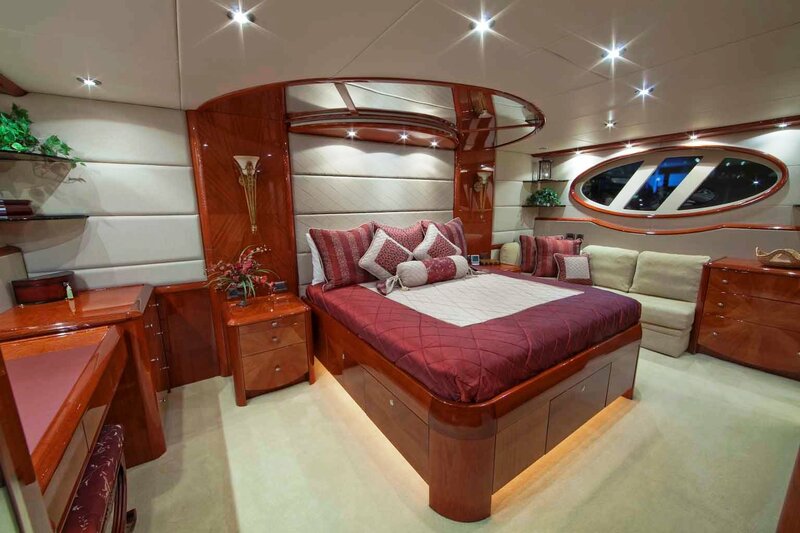 In the bow, forward of the galley there is a twin room with upper -under bunks and full en suite bathroom. 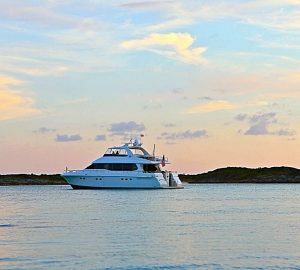 M/Y CASTAWAY features a large flybridge with hard top, with a table for dining al fresco, a sit down bar, large sun pads, a Spa Pool, adjustable lounge chairs for sun bathing and BBQ grill. The perfect spot to spend the day or evening. Modeled after the eighty footer, the Lazzara 84 expands living accommodations for the owner by placing the crew quarters aft. You’ll be hard pressed to find a more spacious yacht with these specs anywhere in the world. 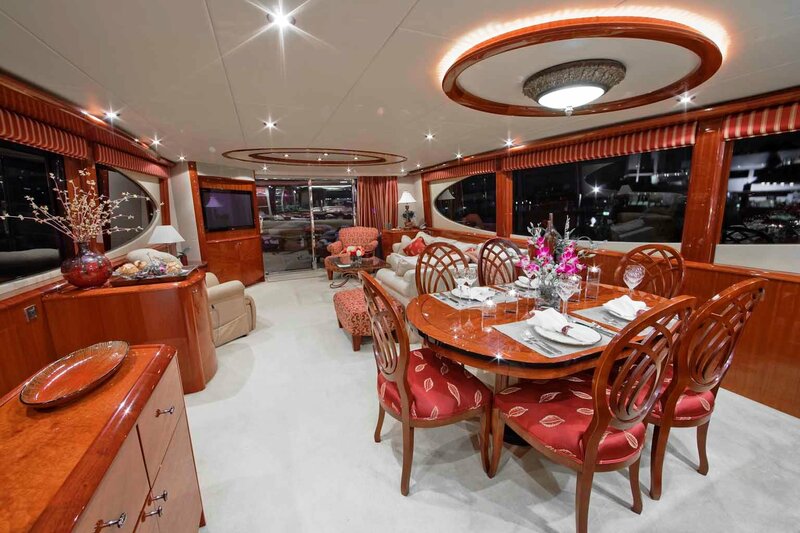 Motor yacht CASTAWAY is able to accommodate up to 8 guests in 4 cabins. 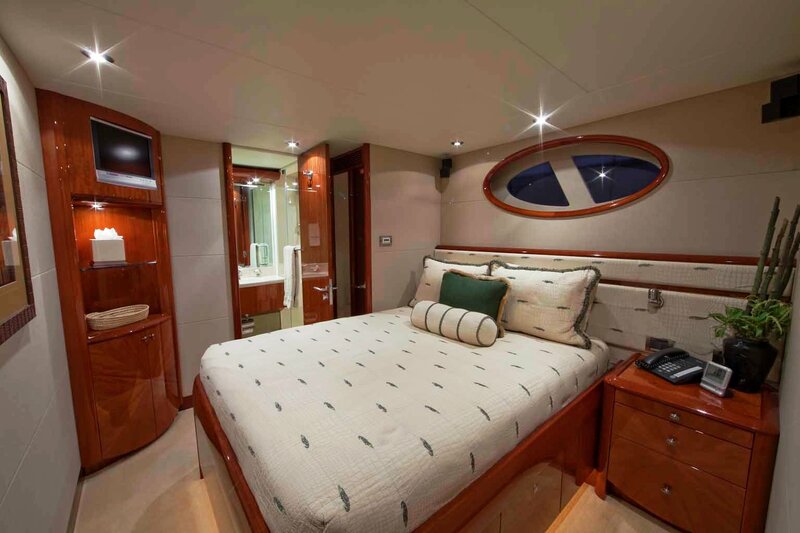 Her Master cabin features a king size bed, a couch and sitting area to port and an office desk or vanity to starboard. 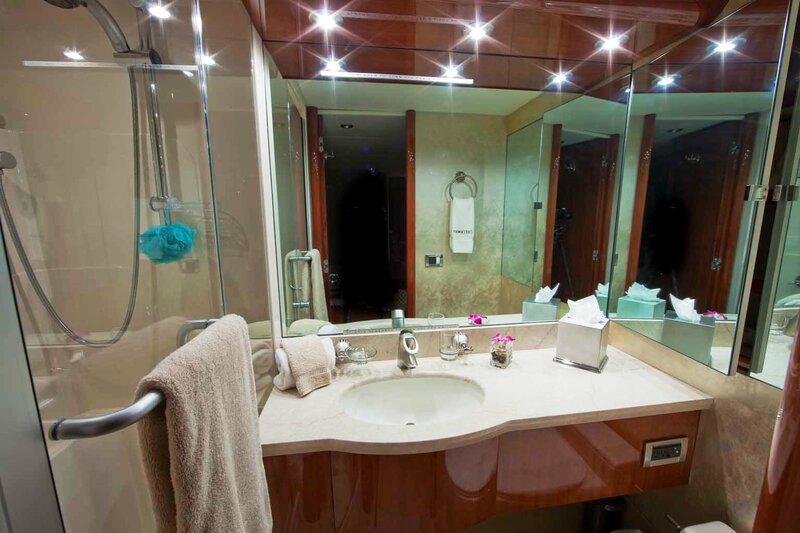 The master ensuite is very large for a yacht this size and features a full Spa Pool tub and shower. 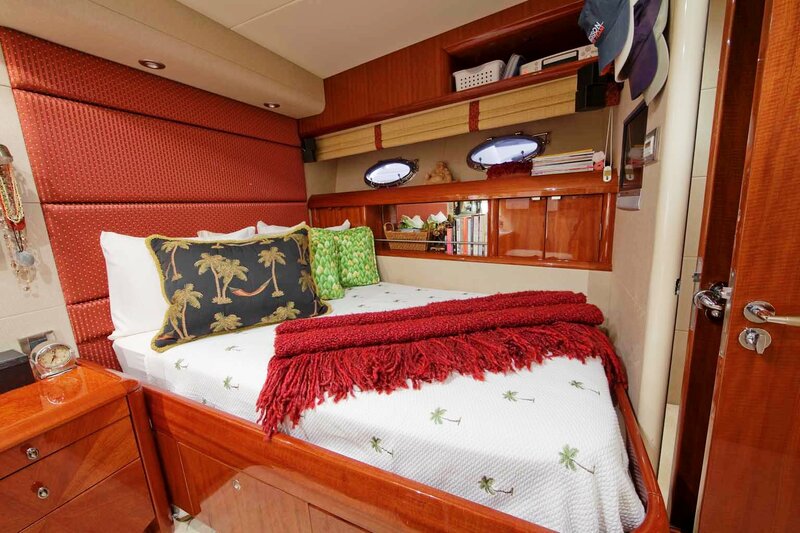 There are two mirror imaged guest staterooms that feature a queen size bed with a large closet and plenty of space. Each room has its own en suite bathroom with large shower and vanity area as well as a full entertainment set up. 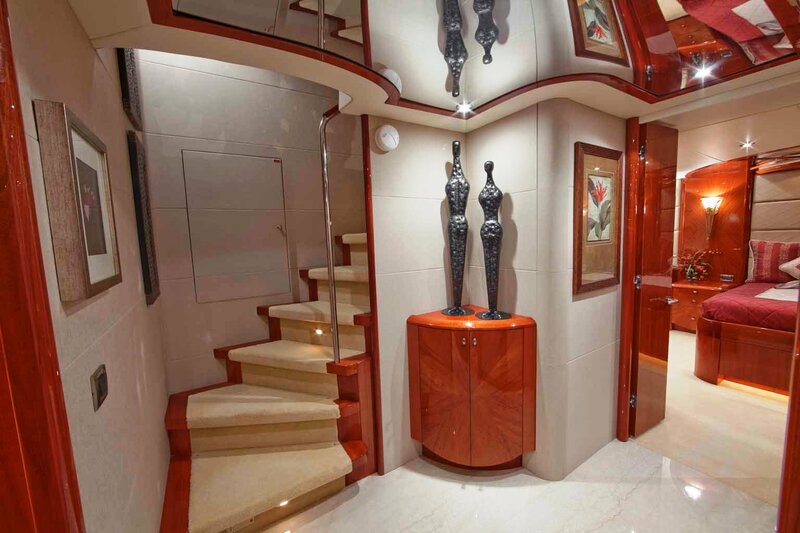 In the bow, forward of the galley there is a twin room with upper -under bunks and full en suite bathroom. The Lazzara 84 CASTAWAY has a good range of amenities onboard including a 13' Novurania with a 60hp Yamaha, snorkelling gear, a wake board, a kneeboard, water skis and towable Tubes. There is full water access from the hydraulic swim platform that will lower 3 feet below the surface. M/Y CASTAWAY features an all teak walk around deck leading to the sun pad on the bow and the two 11' Jimmy Lewis stand up paddle boards are stored along the way. Communications onboard include Sat Com and cellular, internet wi fi booster, based on availability in the area. Audio Visual Equipment and Deck Facilities include a Large flybridge with hard top, table for dining, sit down bar, large sun pads, Spa Pool, adjustable lounge chairs for sunning and BBQ grill. The main salon, aft deck and all guest staterooms have independent Direct TV service for the TV, DVD players, stereo and I Pod hook ups. The main salon also boasts an X box, full DVD and CD library and assorted board games.